AWAKE dokumentiert den friedlichen Widerstand der indigenen Bewohner_innen des Standing Rock Sioux Reservats nahe Cannon-Ball in North-Dakota gegen die Dakota Access Öl- Pipeline (DAPL). Am 22. April, dem alljährlichen Earth Day, feierte die neue Dokumentation der Regisseure Josh Fox, James Spione und Myron Dewey Premiere auf dem prestigeträchtigen Tribeca Film Festival in New York City. Wir bringen AWAKE und den #NODAPL – Widerstand im Rahmen eines Community-Screenings nach Berlin. Ihr erfahrt außerdem, auf welchen Wegen ihr Euch vom 03.-05. November im Rheinland mit Ende Gelände für globale Klimagerechtigkeit einsetzen könnt. AWAKE follows the dramatic rise of the native-led peaceful resistance at the Standing Rock Sioux Reservation near Cannon Ball, North Dakota against the Dakot Access Oil Pipeline (DAPL). On April 22nd, Earth Day, the documentary from directors Josh Fox, James Spione and Myron Dewey, premiered at the prestigious Tribeca Film Festival in New York City. We bring AWAKE and the #NODAPL resistance as a community screening to Berlin. 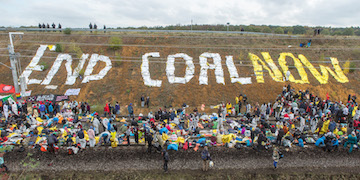 Besides, you will learn how you can take action for global climate justice from November 3th to 5th in the Rhineland with Ende Gelände.